The general tenor of reviews of Glass suggest that, after a two-film renaissance consisting of 2015's The Visit and 2017's Split, writer-director M. Night Shyamalan is up to his bad old tricks again. But I don't know, I think that this actually is a return to form: sharp-looking movies with with an elegantly classical visual sensibility that falters against clumsy dialogue that overarticulates themes, meandering pacing, dopey climaxes, and a generally square earnestness that somehow makes all of the above kind of charming in addition to kind of bad, feels pretty much exactly like we should expect of the filmmaker behind 2000's Unbreakable and 2002's Signs. It's as if his career had continued its gentle decline rather than racing at full speed off of a cliff with 2006's Lady in the Water. Compared to that film - or 2008's The Happening - or dare I even invoke it's name, 2010's The Last Airbender. Glass isn't remotely down at that level, so let's not rebury the man's career just yet. On the other hand, Glass might not be shriekingly awful, but it's also not especially good. Retroactively making Unbreakable and Split into the first two parts of a trilogy (as promised by Split's mid-credits scene), Glass can't live up to the strengths of either, and largely replicates Unbreakable's foremost flaws, a leaden pace and rather drearily self-important dour tone. The film picks up in Philadelphia only a few weeks after Split ended, with the body of Kevin Wendell Crumb (James McAvoy), hosting 24 different personalities including a super-strong cannibal psychopath named The Beast, having escaped the police after releasing his kidnap victim Casey (Anya Taylor-Joy). 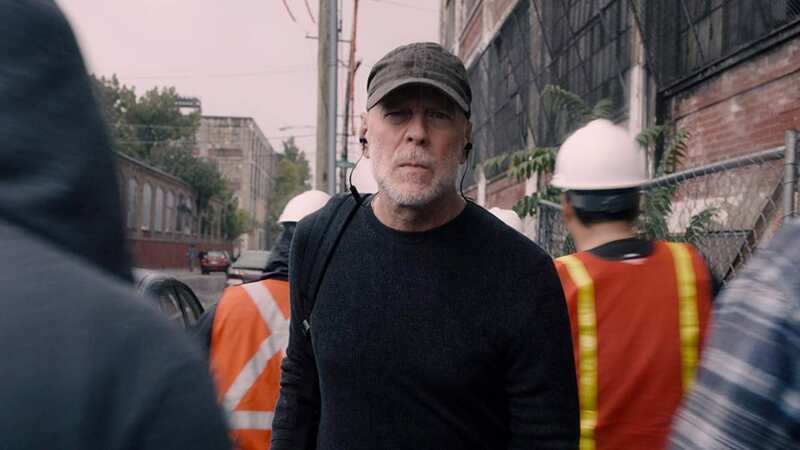 During that time, The Horde (the collective name for the many identities sharing Kevin's body, divided into pro- and anti-Beast factions) has kidnapped another set of four young women, and so come to the attention of David Dunn (Bruce Willis), a man impervious to physical harm who has been quietly serving as a vigilante hero during the 19 years since he survived an unsurvivable train derailment orchestrated by Elijah "Mr. Glass" Price (Samuel L. Jackson). Elijah, who suffers from a disease making his bones extremely fragile, has spent the same 19 years in a hospital for the criminally insane, kept under remarkable levels of sedation, lest he use his super-intelligence to hatch some unfathomable evil scheme. Skip ahead to Kevin and David ending up in the same hospital under the care of Dr. Ellie Staple (Sarah Paulson), an expert in superhero delusions, and the hatching of the aforementioned unfathomable evil scheme. Shyamalan intends for this to be a commentary on superhero comics. Oh, how unfathomably obvious it is that this is his intent. Unbreakable was the same, of course, but there's a huge difference between the two. In 2000, superheroes were still the stuff of marginal nerd culture, and superhero movies were still reeling from the genre-crushing failure of 1997's Batman & Robin (a few months before Unbreakable, X-Men had righted the ship, but was too young for its impact to be in any way felt) In 2019, superheroes are the dominant force in popular culture. Which means that we need a good Unbreakable now more than ever, looking at the impact supeheroes have in a very real world, low-key and dirty and devoid of fantasy elements, except that when I say this is a commentary on superhero comics, that is exactly what I mean. 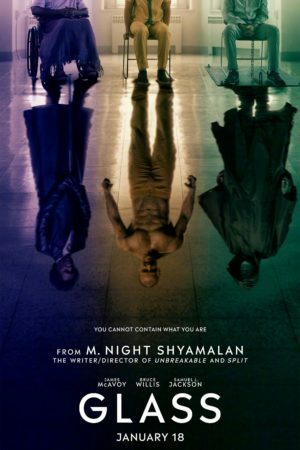 To judge from Glass, the only interest Shyamalan has in the present wave of superhero cinema is that it meant he was able to get this film made. At any rate, the film presents a very sincere, very lugubrious series of lectures on superheroes as modern myth, and things of that nature, and like I said - it's just so straitlaced that I can't help but find it sweet. Shyamalan believes deeply, exhaustingly in comic books, and he believes just as deeply in having his characters believe in them, and that total lack of cynicism is enormously rewarding. But it doesn't inherently make for good storytelling, and Glass is just all over the damn place. The fact that it has to be a sequel to two films in two different genres altogether (the first a dramatic character study inside a mystery, the latter a psychological horror-thriller), with two wholly different sets of story concerns, never successfully resolves itself. Overall, this is a very satisfactory Split sequel, even if it drops some plot threads and rips all the guts out of Casey backstory and character arc. It's a rather dismal Unbreakable sequel, for a good many reasons, high among them being Willis's awesomely transparent disinterest in doing anything but standing still in front of the camera and looking straight forward; it's also mostly from the Unbreakable side of its lineage that Glass gets all of its worst plot developments, leading to a muddy, complicated final 30 minutes that includes a goddamn jungle of false endings (there are at least four different scenes that could have served as the last one, and some of these scenes have multiple ending points within them). Besides which, the film ends up needing to split its attention too much: between Kevin, David, Elijah, and David's son Joseph (Spencer Treat Clark), Glass has a lot of characters it wants to make the focal point of its low-key, humane take on comic book plotting, and the only point where the writing and acting coalesce is around Kevin. Who is a wonderful schlocky character, and McAvoy's performance is just as impressive here as in the last film, oscillating through different personalities in the blink of an eye, and with a broader range of personalities on display this time, as well. There's no level on which this is subtle; Glass creates an entire plot point around an excuse to force McAvoy to make these quick, on-camera shifts, and it's the kind of role that will always result in a gimmicky bravura performance. But it's a damn persuasive gimmicky performance. Beyond giving McAvoy more chances to show off, the script is a bloated, wandering mess; Elijah doesn't appear at all for at least the first quarter and doesn't have anything to do for at least the first half, and until that point the movie is devoted to a lot of talking and stalling. It is, at least, quite striking to look at the stalling: no Shyamalan film has looked this good or had this consistent of a visual schema since 2004's The Village (which has in its 15 years gone from being the director's first intensely awful failure to being part of what we sigh about wistfully when we remember "the good ones"). The use of color, in particular, is both dramatically obvious (it is themed to characters, and saturated according to how much they believe in the transporting power of comics) but also so detailed and methodical that it works anyway; it is, in fact, very much like the use of color in an unusually thoughtful four-color comic book, straightforward and necessarily limited, but far more elaborate than was at any rate necessary. More subtly, cinematographer Mike Gioulakis uses some very interestingly curtailed focal depth to sculpt the film's three-dimensional spaces, creating planes within the boxy rooms that dominate the film's mise en scène. It's a fine visual strategy for isolating the characters while also showing them existing within the world, and it helps to add just a slight gloss of unreality to the deliberately drab production design. In fact, Glass looks good enough, with enough beautifully simple compositions, that I find myself returning to my longstanding complaint: this Shyamalan fella, he might be able to make some real masterpieces if he'd just stop writing his own movies. Glass has the visual energy and appreciation of iconic superhero imagery to be truly memorable, but it's so shapeless, slow, and boring that those visuals are never given a chance to survive.